What Is Wireless Home Theater? A Wireless Home Theater or Entertainment system can refer to setup that simply has a set of wireless surround sound speakers to a system that incorporates wireless home networking. However, there is a lot in between. Let's explore the wireless options that are available and can be incorporated into a home theater system. The most common wireless product that is available for home theater is wireless surround sound speakers. However, don't let the term "wireless" fool you. For a speaker to function it needs two types of signals. First, the speaker needs to have access to the music or movie soundtrack in the form of electrical impulses (the audio signal). Second, the speaker needs a physical connection to an amplifier to actually produce the sound (either powered by battery or AC power outlet). In a basic home theater wireless speaker setup, a transmitter is physically connected to preamp outputs on a receiver. This transmitter then sends the music/movie soundtrack information to a speaker that has a built-in receiver. However, in order to produce the audio signal that is wirelessly transmitted so you can actually hear it, the speaker needs additional power. This means that the speaker still has to be physically attached to a power source and an amplifier. The amplifier can be built into the speaker housing or, in the case of some setups, the speakers are physically attached with speaker wire to an external amplifier that is powered by batteries or plugged into the house AC power source. In other words, you may have eliminated the long wires that typically go from the signal source, such as a stereo or home theater receiver, but you still need to connect the "wireless" speaker to its own power source in order for it to actually produce sound. Currently, wireless speaker technology is employed in some all-in-one home-theater-in-a-box systems, but WISA (Wireless Speaker and Audio Association) coordinates development and standardization of wireless speaker products specifically for home theater application. Although full wireless speaker systems suitable for home theater applications are few, one practical wireless solution for home theater is the wireless powered subwoofer. Since subwoofers are typically self-powered (the required connection to AC power) and they are sometimes located far from the receiver they need to receive the audio signal from, incorporating a wireless transmitter for the subwoofer into the receiver and a wireless receiver into the subwoofer is a very practical idea. This is becoming very popular on soundbar systems, where there are only two components: the main sound bar and a separate subwoofer. However, although the wireless subwoofer arrangement eliminates the long cable usually needed, and allows more flexible room placement of the subwoofer, both the soundbar and subwoofer still need to be plugged into an AC wall outlet or power strip. Bluetooth technology has impacted the way consumers connect portable devices, such as headsets for cell phones. However, with the advent of wireless technology for home entertainment, Bluetooth is also a method for wireless connectivity in home theater systems. For instance, in the previous section on wireless subwoofers, Bluetooth is the main technology employed. 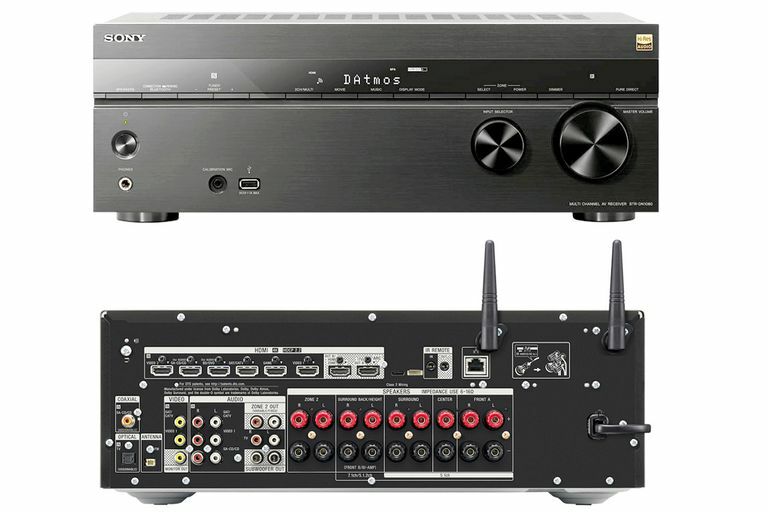 Also, more home theater receivers are now being equipped built-in Bluetooth or ports that will accept an accessory Bluetooth receiver that allows consumers to access audio/video content wirelessly from Bluetooth cell phones, portable digital audio/video players, or even a PC. Check out one such product made by Yamaha for its home theater line. Also, Samsung is utilizing Bluetooth as a way to stream audio directly from some of its TVs to a compatible Samsung Sound Bar or audio system. Samsung refers to this as SoundShare. Another type of wireless connectivity that is becoming more popular in the home is wireless networking (based on Wi-Fi technology). This enables consumers to use their laptop PC anywhere in the house or even outside without having to use a phone cord or Ethernet cord to connect to the internet or another PC-related device in the house. This is done by having a wireless transmitter/receiver built into the laptop, or other devices, communicate with a central router that may have a combination of both wireless and wired connections. The result is that any of the devices connected to the router can access the internet directly or communicate with the other devices connected to the router. As a result of this technology, new products that incorporate communication and content access between PC-based and home theater components using both wired and wireless connectivity, are now on the scene. Check out examples included in many network media players/media streamers, Blu-ray Disc players, LCD TVs, and Home Theater Receivers that incorporate WiFi and wireless network connectivity. If you have an iPod, iPhone, iPad, or Apple TV, you are familiar with Apples wireless streaming connection option: AirPlay. When AirPlay compatibility is integrated into a home theater receiver, it can gain wireless access to content streamed or stored on AirPlay devices. A variation of Wifi, known as Miracast, is also being implemented in the home theater environment. Miracast is a point-to-point wireless transmission format that allows both audio and video content transfer between two devices without the need to be near a WiFi Access Point or router. For full details, including specific examples of how it can be used, read our article on Miracast wireless connectivity. Another form of wireless connectivity appearing on the scene is the transmission of high definition content from a source device, such as Blu-ray Disc player to a TV or Video projector. This is accomplished by connecting an HDMI cable from the source device to an accessory transmission box that sends the signal wirelessly to a receiving box that, in turn, is connected to the TV or video projector using a short HDMI cable. Currently, there are two competing camps, each supporting their own group of products: WHDI and Wireless HD (WiHD). Another ingenious technology that eliminates wired connections actually isn't truly wireless but utilizes your own house wiring to transfer audio, video, PC, and internet information through a house or office. This technology is called HomePlug. Using special converter modules that plug into your own AV wall outlets, the consumer can access all audio and video signals coming to and from your home theater components (see their diagram). Audio and video signals simply "ride" on top your regular AC current. Although strides are definitely being made in wireless connectivity for the home theater environment, it must be pointed out that sometimes a wired connection option is best. For example, when it comes to streaming video from content sources, such as Netflix, Vudu, etc... streaming via Wifi might not always be stable or as fast as a wired connection, resulting in buffering intermittent dropouts. If you experience this, first change the location and/or distance between your streaming device (Smart TV, media streamer) and your internet router. If that doesn't solve the problem, then you may have to resort to that long ethernet cable you were trying to avoid. Also keep in mind that Bluetooth and Miracast work over short distances, which should be fine in an average size room -- but if you find that your wireless connection produces inconsistent results, you should still have the option of a wired connection between your devices. The wireless home theater/home entertainment revolution is still having growing pains. Although new wireless platforms and products for use in the home theater/home entertainment environment are being introduced on a continuing basis, so far there is no one wireless "universal" platform that can do it all and work with all product types, brands, and products. So, as is the case with all technology, it's important to do some research to decide which wireless technology is best for you. Stay tuned as more develops in the wireless home theater/home entertainment landscape.